Controls are vital in any experiment to reliably distinguish your results from background variation and non-specific effects. Here we will discuss some essential controls for flow cytometry you must consider to ensure publication quality flow cytometry data. The first thing to identify in flow cytometry is your cell population by its forward and side scatter characteristics. After this you need to determine where the negative population will be. To do this you should always have an unstained population. This will allow you to determine the level of background fluorescence or autofluorescence and set your voltages and negative gates appropriately. Figure 1. Unstained controls. 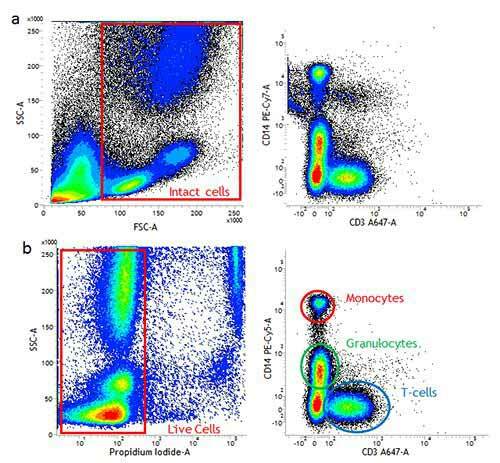 Unstained lymphocytes are used to set the negative population (a), allowing the positive populations (b) stained with CD8 (MCA1226) and CD4 (MCA1267) to be visualized. The use of isotype controls in flow cytometry is controversial and divides researchers. In flow cytometry, background levels of staining can be a problem especially with rare populations, cells with low expression levels and when building multicolor panels. Isotype controls have been developed for surface staining and their role is to ensure the observed staining is due to specific antibody binding to the target rather than an artefact. They should not to be used to determine positive versus negative cells or to set gates, and may not be suitable for intracellular staining. To find out more about how isotype controls can be used in your flow cytometry experiments, when to use them and which ones to use, go to our dedicated isotype controls webpage. When performing multicolor flow cytometry, single stained samples are essential to determine the levels of compensation. Single staining will reveal the level of spectral overlap between different fluorophores and allow you to remove or compensate for this overlap. This can be seen in Figure 2 a where the fluorescence of FITC can be detected in the PE channel. Figure 2 b shows how the data looks when properly compensated. This spectral overlap should be compensated for every fluorophore used. Important things to consider, when using single stained samples for compensation, are that the fluorophore needs to be the same and its brightness similar to the one used in your experiment and you need to collect enough events to be statistically significant. For more detailed information on fluorophores and compensation check our Flow Cytometry Basics Guide available to download or as a hard copy. Figure 2. Fluorescence compensation corrects for spectral overlap. 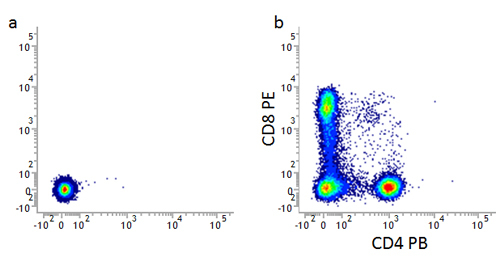 Lymphocytes single stained with CD45RA FITC (MCA88) showing fluorescence being detected in the PE channel before (a) but not detected after compensation (b). The presence of dead cells in your sample can greatly affect your staining and therefore the quality of your data. This is because dead cells have greater autofluorescence and increased non-specific antibody binding, leading to false positives and reducing the dynamic range. This may make identification of weakly positive samples and rare populations difficult. Whilst using gates based on the forward and side scatter can help to remove debris and dead cells it will not remove them all. Types of viability dyes to identify dead cells include DNA dyes such as ReadiDrop™ Propidium Iodide or ReadiDrop™ 7-AAD, or protein binding dyes such as VivaFix™ which are fixable for added convenience. Figure 3. Using a live/dead to remove dead cells can improve your staining. (a). Use of forward and side scatter gating (red rectangle) may not remove all dead cells and some non-specific binding may still be present. (b). Exclusion of dead cells using propidium iodide staining (red rectangle) means less non-specific binding and easier identification of positively stained populations. Images shown here are human peripheral blood stained with CD14 (MCA1568) and CD3 (MCA463). Figure 4. Fc blocking. 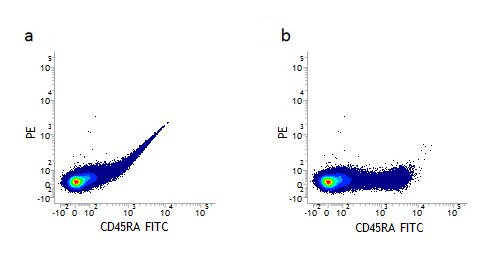 Staining of THP-1 cells with FITC labeled mouse anti-human CD11a in blue (MCA1848) or mouse IgG2a negative control:FITC clear (MCA929F) in the absence (a) and presence (b) of human SeroBlock (BUF070A). Fc receptors are found on monocytes, macrophages, dendritic cells and B cells. As the name suggests they bind antibodies via their constant Fc domain rather than the antigen specific Fab domain. This type of binding can lead to false positives and meaningless data. In order to prevent this type of binding, Fc blocking reagents (e.g. Human Fc Seroblock and Murine Fc Seroblock) have been developed which, when added to a staining protocol, can ensure that only antigen specific binding is observed. Fluorescence minus one (FMO) controls are important when building multicolor flow cytometry panels as they will help you determine where your gates should be set. This is particularly important when identifying a positive from a negative population and when the expression levels are low. When acquiring data, there is fluorescence spread, especially with brighter fluorophores, which is particularly noticeable after compensation and cross laser excitation. Careful experimental design and avoiding channels which have a large amount of spreading will help reduce this influence, but FMO controls are still important. FMO controls are the experimental cells stained with all the fluorophores minus one fluorophore. An example of an FMO matrix is shown below in table 1. Figure 5 shows how the fluorescence spread from other channels can affect the data ensuring you can position your gates accordingly, taking into account the fluorescence spread. FMO controls should be done for all the fluorophores in your panel when starting a new multicolor experiment. This will then allow you to assess the spread of all the fluorophores into your missing channel and set your gates accordingly. Figure 5. Use of FMO controls to determine fluorescence spread and to set accurate gates. 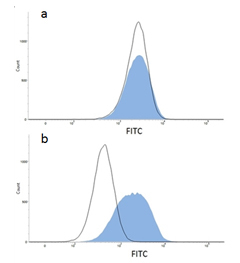 Dot plots showing the spread of fluorescence into the PE-Cy5 channel in the FMO-PE-Cy5 control compared to the unstained control allowing correct gating (black dotted line) for the fully stained sample. Isotype controls have been optimized for cell surface staining to control for non-specific binding of antibody and fluorophore. They are therefore only one of several controls that may be performed to accurately detect your positive population. Because intracellular staining requires fixation and permeabilization which can affect antigen detection, autofluorescence, fluorophore brightness and cell morphology, other controls are necessary. These can include biological controls, such as stimulation/blocking experiments and negative/positive controls, which are described in more detail below. To find out more about optimizing your intracellular staining go to our intracellular staining tips page. In addition to staining and isotype controls, you should also consider biological controls that will enable you to determine staining specificity and experimental limitations. They are important for all staining, but are more important for intracellular staining which can have higher background fluorescence. Controls include known negative samples and known positive samples. Examples of these are: cells known from the literature to either express or lack expression of the antigen of interest, cells where the antigen has been knocked down or out, using RNAi or CRISPR technology to produce a negative cell, or cells which have been transfected and the antigen is being over expressed to ensure positive staining. For some experiments such as cytokine release measurement, an unstimulated and fully stimulated sample is important to determine both positive results and the dynamic range of fluorescence staining. As we have shown, controls are one of several important considerations in flow cytometry. Other examples include careful sample preparation, doublet discrimination, staining protocols and appropriate fluorophore handling, many of which were recently covered in our Optimize your Flow Cytometry webinar, now available to view on demand. To help you optimize your flow cytometry we have validated antibodies, supporting reagents and resources.